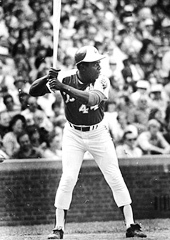 Considering that he hit more home runs than everyone in MLB history, except Barry Bonds, it’s not surprising that Henry Aaron (755) hit back-to-back long balls in the same game more than two dozen times. May 18, 1957 vs. Pittsburg, Aaron hit homers in consecutive at-bats in the 3rd and 4th innings. April 24, 1958 vs. Cincinnati, Aaron hit homers in consecutive at-bats in the 3rd and 5th innings. July 15, 1958 vs. St. Louis, Aaron hit homers in consecutive at-bats in the 2nd and 4th innings. May 3, 1059 vs. San Francisco, Aaron hit homers in consecutive at-bats in the 1st and 4th innings. June 21, 1959, vs. San Francisco, Aaron hit homers in consecutive at-bats in the 6th and 7th innings. July 29, 1959 vs. Chi Cubs, Aaron hit homers in consecutive at-bats in the 1st and 3rd innings. July 7, 1961 vs. Pittsburgh, Aaron hit homers in consecutive at-bats in the 1st and 3rd innings. July 29, 1962 vs Cincinnati, Aaron hit homers in consecutive at-bats in the 4th and 6th innings. August 19, 1962 vs. San Francisco, Aaron hit homers in consecutive at-bats in the 2nd and 3rd innings. August 11, 1964 vs. Houston, Aaron hit homers in consecutive at-bats in the 3rd and 6th innings. May 4, 1965 vs. Houston, Aaron hit homers in consecutive at-bats in the 6th and 8th innings. August 11, 1965 vs. St. Louis, Aaron hit homers in consecutive at-bats in the 3rd and 5th innings. Sept. 17, 1965 vs. San Francisco, Aaron hit homers in consecutive at-bats in the 1st and 3rd innings. June 8, 1966 vs. NY Mets, Aaron hit homers in consecutive at-bats in the 1st and 3rd innings. Sept. 13, 1966 vs. Chi Cubs, Aaron hit homers in consecutive at-bats in the 1st and 3rd innings. May 11, 1968 vs. L.A., Aaron hit homers in consecutive at-bats in the 1st and 3rd innings. July 7, 1968 vs. Houston, Aaron hit homers in consecutive at-bats in the 4th and 5th innings. April 14, 1971 vs. Cincinnati, Aaron hit homers in consecutive at-bats in the 1st and 4th innings. June 21, 1971 vs. Montreal, Aaron hit homers in consecutive at-bats in the 7th and 9th innings. July 21, 1971 vs. San Diego, Aaron hit homers in consecutive at-bats in the 1st and 3rd innings. Sept. 13, 1972 vs. Cincinnati, Aaron hit homers in consecutive at-bats in the 7th and 9th innings. June 9, 1973 vs. St. Louis, Aaron hit homers in consecutive at-bats in the 1st and 3rd innings. July 8, 1973 vs. New York, Aaron hit homers in consecutive at-bats in the 4th and 6th innings. Sept. 3, 1973 vs. San Diego, Aaron hit homers in consecutive at-bats in the 3rd and 5th innings.